The only way you wouldn’t know who a tout is if you probably live, work, school and don’t get past your small neighbourhood in Maitama, Asokoro or Banana Island. If on the other hand you have been to places like Ketu, Oshodi, Mushin, Lagos Island or any of the bus garages anywhere in the country, then you will definitely know who a tout is. A Tout is one of those hoodlums fine gentlemen who you find causing yawa trouble at that junction not too far from your home. 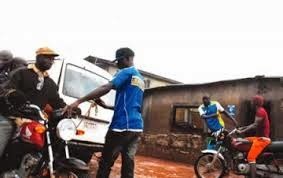 Touts are a great addition menace to the Nigerian society, you either find them harassing workers at construction sites, struggling with commercial vehicle operators to extort shandy, figo, waso or ten fibre money, being used as political thugs or fighting for supremacy in motor parks. In a nutshell, a typical Nigerian tout is in the same category as Dennis the menace, only that they are a very aggressive and hybrid version of the character called Dennis. That’s why it’s a great relief to find that the Nigerian government creating laws to curb the activities of these unscrupulous agents of gombe & kasala violence. The law enacted by the National Assembly is an act to prohibit the touting in all public places and to establish the National Committee against Touting in the Federal Republic of Nigeria and for other related matters. It provides in Section 1 that as from the commencement of the Act, no person or group of persons or association of individuals shall terrorize local or foreign investors at public places or at the airport, seaports, railway station, motor parks, transport owners, commercial drivers, farmers and traders in transit with their farm produce and consignment respectively in different parts of the country. Also no group of persons, association of individuals shall retrain, organize, train or camouflage their activities using names, impersonating the National, State and Local Government Councils to use force or coercion in order to promote personal or group interest promoting touting in public places and any person or group of persons, association of individuals who engages in any act of touting or any act capable of causing detraction, frustration of economic and commercial activities in public places commits an offence under the act. (l) performing such other functions which in its opinion with facilitate the execution of its responsibilities activities under this Act. It should be noted that any persons, group of persons, association of individuals that contravene the provisions of the law, commits an offence and is liable on conviction; (a) in the case of an individual, to a fine of N20,000 or to imprisonment for a term of one year or to both such fine and imprisonment; (b) in the case of a group of persons or association of individuals to a fine of N100,000. The National Anti-tout Committee, Nigeria Police Force and the State Security Service or other persons as may be deemed necessary in any appropriate case, may enter any house, building or any other place whatsoever in which the office or other persons have reason to believe that a person, or group of persons are touting causing disturbance to public peace. Prosecutions for offences under this Act shall be deemed to be instituted by the Attorney-General of the Federation or such officer in the Federal Ministry of Justice as he may authorize so to do until the contrary is proved, and in addition he may authorize the Attorney-General of a State where the offence was committed to prosecute the offence. The High Court of a state shall have jurisdiction to try any offence under this Act. The Act seeks to prohibit touting in public places in the Federal Republic of Nigeria by establishing a National Committee against Touting, to ensure that no person or group of persons, association of individuals harass or terrorize local or foreign investors at the airports, seaports, railway stations, motor parks, transport owners, commercial drivers, farmers and traders in transit with their farm produce and consignments respectively indifferent parts of the country; to also campaign in the radio, television, newspapers and sustain the Government Anti-touts crusade through systematic public awareness strategies of printing and issuing Anti-touts emblems to the general public.